Sen. John McCain had been undergoing treatment since July 2017, and has been absent from Washington since December. McCain’s family has gathered in Arizona, and people close to him say his death is imminent. 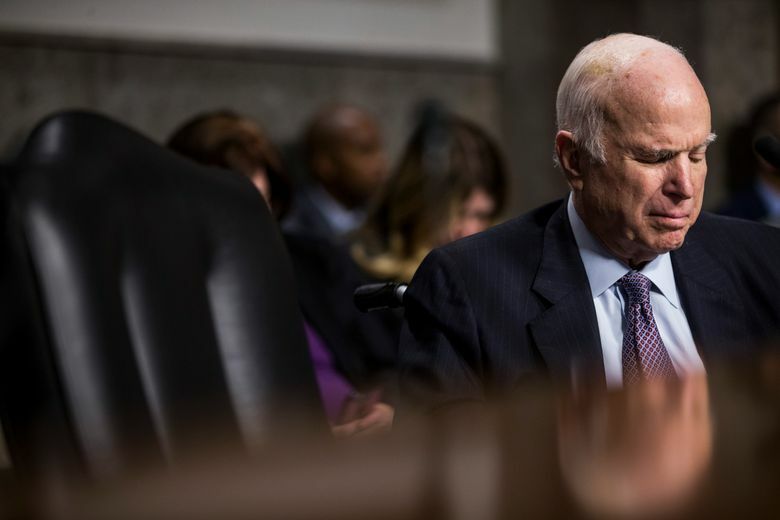 WASHINGTON — Sen. John McCain of Arizona, who has been battling brain cancer for more than a year, will no longer be treated for his condition, his family announced Friday, a sign that the Republican war hero is most likely entering his final days. McCain had been undergoing treatment since July 2017, and has been absent from Washington since December. McCain’s family has gathered in Arizona, and people close to him say his death is imminent. From his ranch in Arizona, McCain had managed to maintain a voice in key foreign policy and military policy debates, sharply criticizing President Donald Trump after his summit with President Vladimir Putin of Russia, an old adversary of McCain. At home, he has welcomed close friends to renew ties. But after decades as a fixture in Washington and a larger-than-life character, he had largely retreated from the public eye. The son and grandson of four-star Navy admirals who spent more than five years as a prisoner of war in Vietnam, McCain rose to become one of the towering figures in U.S. politics, twice seeking the presidency and winning the 2008 Republican nomination for president. In the Senate, he has been both revered as an iconoclast and criticized by many, including Trump, for his willingness to buck his party on issues like campaign finance reform and, last summer, the repeal of the Affordable Care Act.